The NEBO 90 Head Lamp is a powerful and convenient hands-free lighting solution. The push button On/Off switch allows you to cycle through the 3 lighting modes: 1 White LED (90 lumens,) 2 Red LEDs (8 lumens) or 2 Red LEDs in Flash Mode. The red LED is a low-signature light, which ensures stealth in the dark. It is used to enhance night vision. Red light works well with night vision scopes and goggles since it does not interfere with night vision technology and is not visible to the human eye over long distances. Providing great contrast on maps and charts, the red LED is a necessity for any pilot, vehicular operator or other specialists who need to preserve night vision when reading charts, map and checklists. The red LED makes reading in little or no light possible. The light from the 90 lumen power LED is visible up to 100 meters. The LEDs are rated for 110,000+ hours of life. The head lamp also has an adjustable strap to ensure that the head lamp can be worn securely in any situation. The head of the head lamp tilts 90 Degree to direct light wherever you need it. 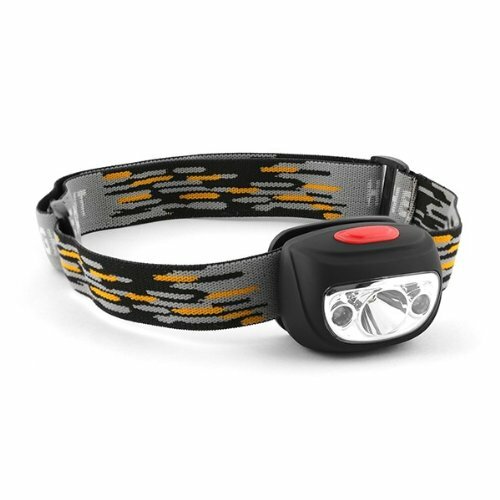 Powered by 3 AAA batteries (included), the 90 Lumen Head Lamp is tough, reliable, lightweight and completely shock-proof. If you have any questions about this product by NEBO, contact us by completing and submitting the form below. If you are looking for a specif part number, please include it with your message.